The pinnacle of athletic achievement. The Summer Games. 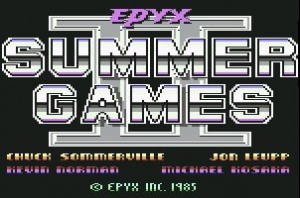 The second Epyx sports title (and third Virtual Console release) provides eight entertaining events, of which half can be enjoyed split-screen with another player. As usual, you have a choice of which events to compete in (or practice) and how many players there are – each represented by their name and country. With the (debatable) exception of cycling, none of the events rely on “joystick waggling” but are instead controlled by a steady rhythm of movements and your timing. 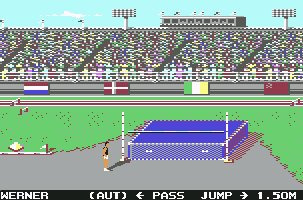 Triple Jump gets things going, and sees you hop, step and jump your way to the gold – assuming you don’t fall over en route. This simple event has easy controls and automatic running, so all you have to worry about is timing each part correctly. You have three attempts to get the furthest distance. 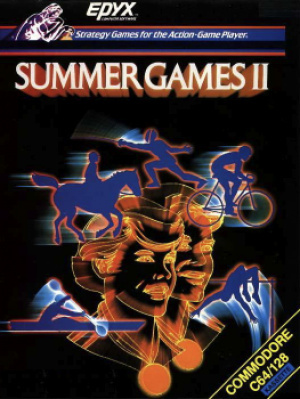 Rowing is the second event on offer, and one that can be played against the computer or a friend. Build up speed with alternate left and right movements, but in a slow and controlled manner, taking care to finish each stroke before starting the next. The computer player is fair and beatable, whilst never feeling like a complete walkover. Javelin provides the third challenge. 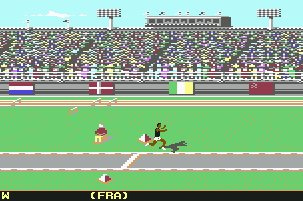 Run as fast as you can (by repeatedly pressing the fire button) and then release the javelin at the angle of your choosing, before you run out of track. Watching the javelin fly through the air is good fun, as you try to anticipate where it will come down. All too often your angle is too shallow or steep, but it is very satisfying when you get it right. Equestrian follows, and you need to do your homework to excel at this event. The theory is simple; ride your horse to the end of the course, navigating various jumps on the way. In reality, you need to keep a cool head and remember a variety of controls and timings to have any chance of finishing. Any falls (or refusals to jump) result in a number of “faults” being added to your score. Whilst initially frustrating, with practice and patience this event is actually very enjoyable, and it is easily possible to finish without any faults at all. High Jump comes next, with possibly the hardest timing of any event. You can choose the height of the bar to jump (starting at the lowest is recommended! ), and have three attempts to clear it. Should you successfully complete a jump, you will then be able to increase the height and have another three attempts, and so on. Don’t be surprised if it takes a while to “get” this event – there are a number of controls to remember and the timing is very strict (but fair, it is possible to clear even the maximum height with practice). 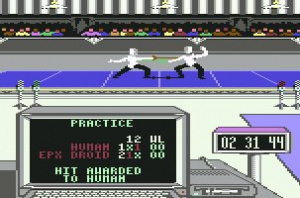 Fencing is by far the most strategic event included, as you try to outwit your opponent (be it computer or human) and land five hits on them (or get the most hits within a three minute time limit). Although there are a number of controls to remember, this event is fairly relaxed and the computer provides a decent challenge. Cycling proves to be the most strenuous event, making you rotate the controls in time with an on-screen arrow to pedal faster. Unlike rowing, this is a fast paced rhythm that is easy to fall out of sync with, thus losing momentum and time. Going too fast is as bad as going too slow, so pacing yourself is the order of the day. Although the race usually lasts less than a minute, it can still be exhausting whether you are competing against the computer or a friend! Kayaking is the final event, and one of the more challenging. Navigate a variety of gates in your kayak, paying careful attention not to go through one the wrong way (always keeping the red marker on your left). Each missed or failed gate adds a twenty-second penalty to your time, so it’s worth attempting each one correctly. The controls are fairly simple, but the course isn’t, so planning ahead is to your advantage. Presentation and graphics are excellent, as you would expect, with the opening and closing ceremonies providing nice bookends to the gameplay. The music is fine, if nothing special, and the sound effects are very good. The controls feel tighter in this game than in other instalments, although good timing is of utmost importance. Two player events are obviously more enjoyable with another person, but the computer does well, with the difficulty level pitched just about right. This is an ideal introduction to the series, with no single event that stands out as being weak and a fair few that are just plain fun. For two or more players this is a must purchase, and if you generally enjoy sports games then you won’t go far wrong here. @Ferret75 - I agree. I might grab it one of these days. Actually, after reading the review more thoroughly, it really does look like an interesting game! I'll probably buy it soon. If Jesus had a say he would release more games that are worthy of my purchase. Sure this game looks fun, but any of the many alternatives would have been better. Next time mayhap. Seems like a random game for C64 release. And only one game for that matter. I was hoping to get Winter Games first. I used to have that on my Apple IIe. I guess I will have to wait yet another week to blow Wii points like the rest of us. ^Makes perfect sense to me. 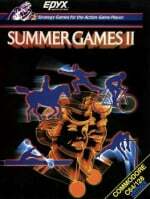 The chronological order these games were originally released in was Summer Games, Summer Games II, Winter Games, World Games and California Games. Since the four latter are already ready for release, why not do them in the original order? Who knows. It would be interesting to see an interview with the guys who get to pick what games get released on the VC and when. But that'll never happen.